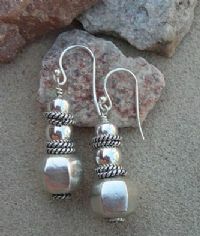 A basic sterling bali design made with french hook earring wires, and bali accents to complete this sure to be a favorite pair of earrings . This design compliments just about anything and everything you may wear. Each pair of earrings are packaged in a soft organza pouch for safe keeping and immediate gift giving.